Piero della Francesca was born in Borgo Santo Sepolcro, Italy. He belonged to the small nobility of the town and, before becoming a painter, he studied mathematics and geometry. That’s why his work is known; for the interest that Piero gives to the linear perspective, as he always was looking for the construction of rational and coherent spaces. On The flagellation of Christ, we see two scenes in the work. To the left, the proper flagellation of Christ where Pontius Pilate (the one who washed his hands from condemning Christ) is sitting in a throne in which we read “OPVS PETRI DE BVRGO S[AN]C[T]I SEPVLCRI” that means “The work of Piero, from Borgo Santo Sepolcro” (a little bit narcissistic, don’t you think?). More on the right, we see Christ punished with whips by two people, while the third, with his back to us, just watches. On the other hand, on the right half of the canvas, we see 3 people, completely unaware of the previous situation, doing nothing. 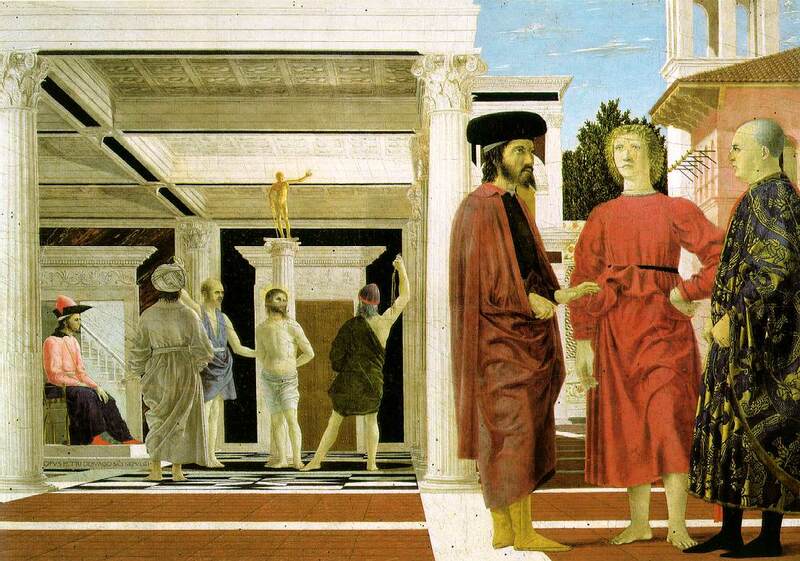 There are several interpretations about the 3 characters at the right and that was called “the great mystery of Piero della Francesca”. Personally, I don’t think it to be that great mystery, but well, let’s say that the more logical interpretation says that the central individual, the blond one, is an angel; while the 2 others, on his sides, represent the Latin and Orthodox church which, at that time, discussed on whether the Holy Ghost (that’s the third person of the Trinity) came only from the Father or so it did from the Son… well, a little bit theological discussion to get into the details. I think the painting seems a bit… empty. I guess that the flagellation of Christ would deserve a painting a little more dramatic, with more passion; but the canvas seems tranquil, distant. And, above all, too rational. Like if the obsession from della Francesca for the perspective would darken richer emotions. We could say that we could hang this painting in the dentist waiting room and nobody would feel disturbed. At last, a curious data from della Francesca: the artist died exactly the very same day that Columbus discovered America: October 12th, 1492. ~ by Álvaro Mazzino on August 10, 2010. It’s really very complicated in this active life to listen news on Television, thus I simply use world wide web for that reason, and obtain the hottest news. second book of the Twilight series by Stephanie Meyer. As much as someone mostly girls would like to say that they don’t really like Romantic Movies, truth is, it is not totally wrong. You gotta admit, that one was almost a cult movie, when talking romantic movies! it may indicate that there is a silver lining in this cloud. You can find some pretty good ones. It is a large investment but will pay off in the end. This entry was posted on August 10, 2010 at 09:42 and is filed under Renaissance.You can follow any responses to this entry through the RSS 2.0 feed.You can leave a response, or trackback from your own site.